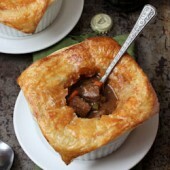 Tender Guinness braised beef and vegetables topped off with flaky puff pastry creates flavorful personal pot pies. Today is day 2 of boozy recipes for St Patrick’s day! If you missed day 1, be sure to check out it out: mini Baileys cheesecakes with chocolate whipped cream. They’d pretty much be a perfect ending to today’s recipe. I ripped this recipe out of a magazine last year. Yes, an entire year ago with the sole plan of making them this year… or eventually, for the Mr to enjoy. He’s the beer drinker. He’s fun to test recipes out on. I knew this would be a sure thing since last year I made an easy slow cooker Guinness beef stew and that was a big hit. This is pretty similar, but does require more hands on time, no slow cookers for this dish but it’s completely worth it. As you’ve probably learned by now, I’m a huge fan of personalized dishes or even bite size dishes. Hence all of the mini cheesecakes floating around, plus they’re just darn cute. Of course beef pie isn’t cute, but this one is personalized! You could of course make one giant version but that’s not nearly as fun. You could even eat the base of this dish as is immediately after it’s cooked but again, just go the distance and make a pot pie. If you really want to go the distance, you could make your own puff pastry. I don’t have a recipe for you for that yet, maybe someday. So since St Patrick’s day is all of a week and a half away, you may or may not be starting to think about dishes you want to make. Regardless, you need these beef pies in your life. Forget the traditional corned beef and cabbage, these beef pies won’t disappoint. 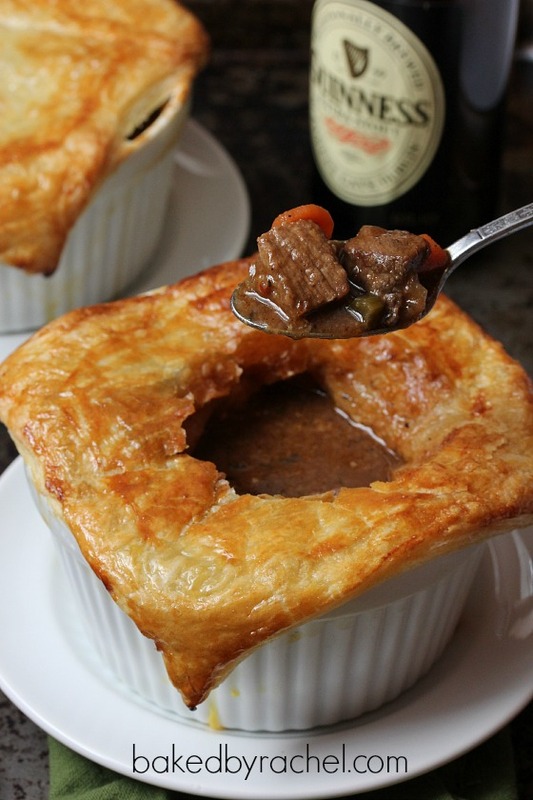 The beef and vegetables are braised in Guinness and broth, creating an ultimate savory and tender stew that is then topped off with flaky golden puff pastry. It’s perfection. Add flour to a large plastic bag, add beef chunks and shake to cover. Transfer to a large platter, season with salt and pepper to taste. Heat vegetable oil in a large oven safe pot (such as a 4-5 quart Dutch oven). Brown meat in batches, removing browned meat to a platter. Add onion, celery, carrots, garlic and water to pot. Cook, stirring and scraping the bottom of the pot with a wooden spoon, until vegetables are tender. Add tomato paste, stirring for 1 minute. Return beef to pot, along with any juices, broth, beer, Worcestershire sauce and seasonings. Cover and cook in the oven for 1 hour. Allow stew to cool completely before adding pastry topper, at least 30 minutes or overnight. Divide cooled stew between two: 16-oz ramekins. Roll out puff pastry large enough to cover two dishes. Cut into equal squares. Lightly bright a 1-inch border around each square with a beaten egg. Invert pastry onto filled ramekins, pressing puff pastry sides to dish. 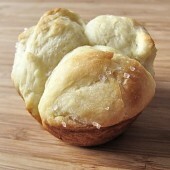 Brush top and sides of pastry lightly with beaten egg. Bake for 15 minutes at 425 degrees, then reduce temperature for 400 and continue cooking for 5-10 more minutes or until pastry is puffed and lightly browned. my fiance would go INSANE if I made these little pies! I can’t believe how close St. Patty’s Day is. NEXT weekend! So crazy how fast this year is flying by. Rachel, these pies are perfectly crusty and gorgeous. PS: I love your pretty spoons! Seriously! I can’t believe it’s already a week into March. I definitely want to try this for St. Paddy’s! What a PERFECT meal for it!! I have a folder of recipes from magazines…a few of them date back 2 years! I wonder if that means, I’ve held onto them for so long because I really really need to make them OR if I’ve held onto them for so long, but never made it, that I should toss them? Hm. If I made this for Paul, he just might marry me all over again. Freakin’ yum! I have two binders for recipes (sweet and savory), when they get too full it’s time to purge out ones I don’t want to keep anymore. So perfect for a cold evening or celebrating St. Patrick’s day here in Boston! I totally want to dive head first into these little pies!!! I am practically jumping through my computer to get at these! You rock! This looks so amazing and I can’t wait to give it a try. Cooking with guinness is actually one of my things to try this year. It makes everything so much more flavorful! Yum! These look divine and I love the puff pastry topping! It’s like a pot pie but SO MUCH BETTER. 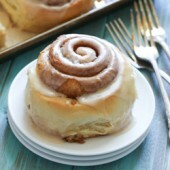 I want to dive head first , mouth open into one of these! Rachel these look awesome. I’m with Megan on this one. At what point do I put on my bikini (and by “bikini,” I mean “one-piece”) and dive head-first into that bowl of goodness? I found your blog last year around this time because of your Guinness recipes…. I think it was a stew and a float? These pies look amazing… and I am all over anything topped with pastry! Rachel this recipe looks amazing! Perfect for these last chilly nights before Spring arrives! loving how golden crisp that puff pastry is! my favorite part about these types of soups that are covered with puff pastries is the initial breaking into the soup part. something about it is so fun, haha – this is a perfect cold weather soup! 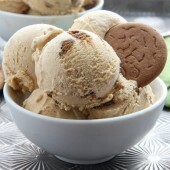 I am all for preparing for Saint Paddys Day when there is recipes like this to prepare. So much flavor packed into one little pie. These are such a great idea, Rachel. 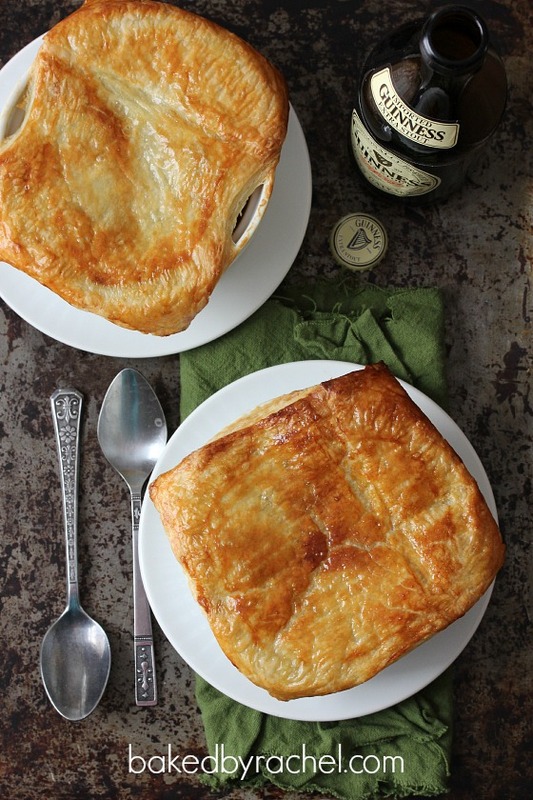 I have been craving pot pie…now even more with beef, Guinness and puff pastry!! So when I was at the store yesterday I was checking out some of the “cool beers” that they had (you know things other than bud light haha) and I was telling myself that I needed to find some more recipes that involved beer because my husband would love them. And then along comes t his lovelyness! haha It was fate and I’ll accept it :) Looks really good !!! Individual dishes are the best! Definitely helps for portion control, which is something I desperately need. And these pot pies – AMAZING! I’m not much of a beer person but I’d gladly devour this! 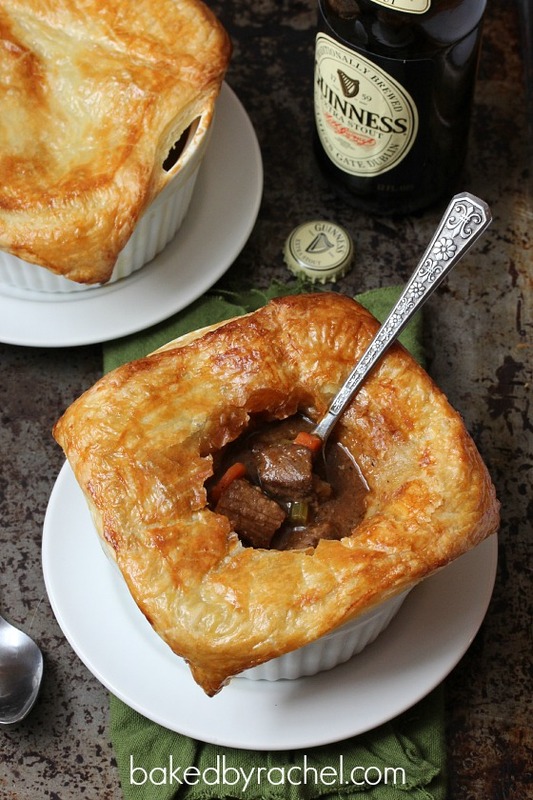 Savory beef stew with a flaky crust? My husband and son are going to love this, but it also looks special enough for company! Thanks. I’ve never had a savory pie, but this makes me want to try one! jusst made these followed recipe to a t :)) amazing!!! Yum!! I made these for my family for St. Patrick’s Day and they were a huge hit! I took the meat out of the oven after about 45 minutes because it seemed to be losing too much moisture. I used some of the leftover beef broth I had to make gravy on the stove and stirred some into the meat mixture before dishing it out and topping with the crust. My husband wants me to make these again next week! Thanks for the fabulous recipe. Thanks for sharing your recipe. I love the way beer flavors food and your ingredients and style look great! I am wondering if anyone would have any idea on how long to bake these if I made them in smaller tart trays to be almost mini-cupcake sized to serve more people? You shouldn’t need too much time. Mostly, just enough time for your puff pastry to cook properly. I’d recommend testing with one and going from there.